After the success of the 27th ProPak Asia 2018, Asia’s No. 1 international processing and packaging industry event held in Bangkok, Thailand last 13 - 16 June 2018. UBM Philippines is now bringing this world-renowned processing and packaging event to the Philippines. The launch of ProPak Philippines will be held on 24 - 26 January 2019 at the World Trade Center Metro Manila, Pasay City. The show will deliver, a first-of-its-kind, ProPak international standard industry trade event focused on processing and packaging and connecting leading international and local suppliers to local and regional buyers right here in Manila. The show is expected to attract over 180 exhibitors from across the world with international pavilions already confirmed from China, Denmark, Germany, Italy, Singapore, Taiwan and the UK, and attract over 6,000 industry trade visitors looking to source for new products, latest technologies and potential business partners that will help generate and support growing business. The DTI has seen the huge potential of the Philippines in the packaging industry and exploring ways to reach its goal to help the people in the packaging industry through expanding their knowledge, innovating packaging solutions, and connect with the international network of the industry. Now, is the right time to continue its support with the Philippine edition of ProPak. The support of DTI for ProPak Philippines was officially signed on Wednesday, 19th September 2018 by Usec. 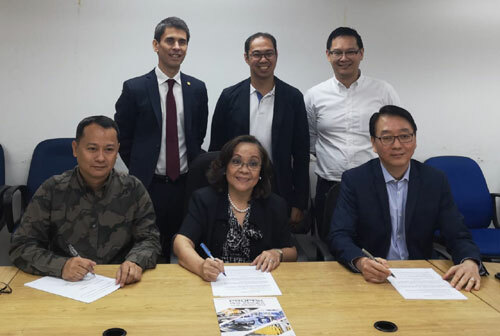 Zenaida Maglaya of Regional Operation Group of DTI, Mr. Dexter Deyto, General Manager of UBM Exhibitions Philippines and organiser of ProPak Philippines, and Lt. Col. Joseph Ross Jocson, President of Packaging Institute of the Philippines (PIP). To witness the signing, Mr. Clarke Nebrao, MSME Development & Exhibits Director of PIP, Mr. Kervin Valero, Press Relations Officer of Philippine Printing Technical Foundation and Mr. Justin Pau, Project Head of ProPak Philippines were present. UBM and PIP believe that with the support of DTI, the show can provide the best solutions to meet the growing needs of the Philippines' processing and manufacturing industries and support to achieve the DTI's objectives to level-up local MSME’s and industry to improve and develop local production, quality, food safety and supply here in the Philippines. ProPak Philippines is organised by UBM, which in June 2018 combined with Informa PLC to become a leading B2B information services group and the largest B2B Events organiser in the world. Please visit www.ubm.com/asia for more information about our presence in Asia. About UBM AsiaUBM Asia recently became part of Informa PLC, a leading B2B information services group and the largest B2B Events organiser in the world. Please visit www.ubm.com/asia for more information about our presence in Asia.